Dezeen Watch Store: check out the new Celeste by Ziiiro at Dezeen Watch Store or try one in person at our Christmas pop-up The Temporium, where readers get 10% discount on all Dezeen Watch Store products. Similar to Ziiiro's earlier model Aurora, Celeste tells the time with colour. 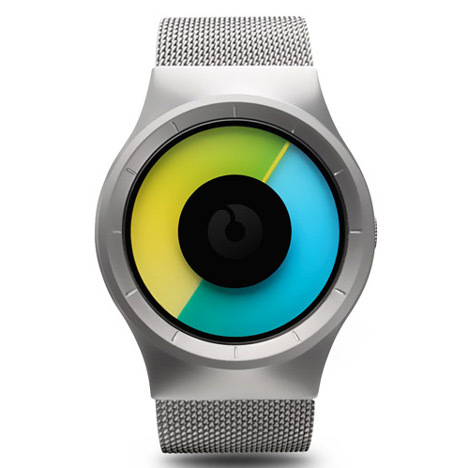 The watch face consists of two coloured disks in place of hands. These graduated disks move over each other as time passes, changing the mix of colour on the face throughout the day. The model with the blue/black face uses the edge of the black area to represent the hour and the blue line at the edge of the blue area points to the minutes. As they overlap a grey colour emerges across the face. The watch with the blue/yellow face uses the edge of the blue area for the hour and the yellow line at the edge of the yellow area for minutes. When the disks overlap the colours combine to create green. 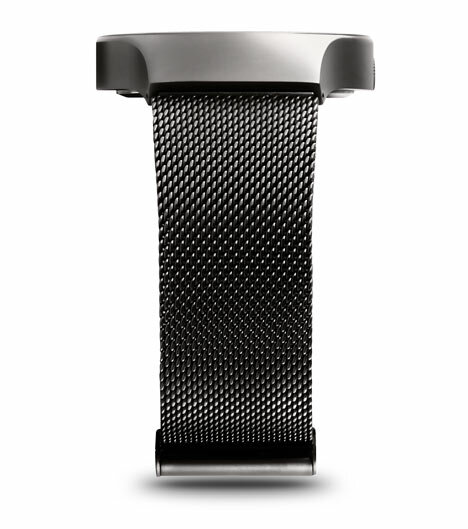 The watch comes with a stainless steel mesh strap in black, silver or gunmetal. Other Ziiiro products on Dezeen Watch Store include Aurora, which has a similar face but features a silicone strap, Gravity and Mercury that use two comet trails to indicate the time and the Orbit with two circling dots. The Temporium presents products by established and up-and-coming designers at 65 Monmouth Street, Seven Dials, Covent Garden, London WC2H 9DG from 1-24 December 2011. Click here to claim your 10% discount and enter our prize draw to win a goodie bag worth over £100.